Scientists have proven that plants can promote healthy living, by increasing oxygen, reducing toxins, and giving an increased positivity to a place. Make over your office with a few of the best plants for reducing stress and creating a more healthy work environment. This is one awesome plant with a crazy sounding name. Mother in law’s tongue is a spindly plant with long, narrow leaves that stand up from the ground, looking almost like tall grass. Mother in law’s tongue is great at surviving, taking little light and subsisting on irregular waterings, so it should be able to withstand anything the office workers have to give it. 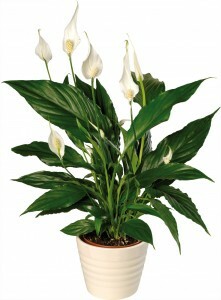 The peace lily is just as pretty as its name, and easy to care for to boot. The leaves of this plant actually droop a bit if in the sun too long, meaning it is likely to thrive in an enclosed coworking spaces. The waxy green leaves and white lily buds aren’t too hard on the eyes either. This is both a practical and attractive option, and is one of the most ubiquitous house plants around. The Janet Craig may sound like a new diet fad, but it is actually one lush looking plant. This type hails from Hawaii and instantly give off a tropical feeling to a space. But even though it is lush and green, this plant takes little water and light. In fact, the plant actually yellows and browns with too much light, making it perfect for an office setting. Don’t be scared–this isn’t a Halloween prank. The spider plant is a beautiful house plant with one unfortunate name. The title comes from the plant’s long, drooping leaves, that resemble the legs of a spider. Its pretty, light green color is nice for some contrast to the above, darker plants. And it can be installed as a hanging plant to add layers of greenery as well. And just to stir things up, why not add a small tree to the mix? A fig tree is a pretty little tree that is easy to care for and beautiful to look at. It won’t grow out of control, but will remain green and healthy with just a bit of water and little light. You can even take care of it with just a misting bottle. Using plants to create a positive space is a cost effect way to benefit your work place. The results have been tested and proven, and you can take advantage with minimal time and effort. Everyone wants to work is a space that is bright and cheery, and the healthy impact on the environment is great as well. This contribution comes from Gaddy’s Plant Hire. A wide range of plants as well as outdoor maintenance services are available at Gaddy’s Plants.